When I get a piece of fabric that I love, I have a hard time cutting in to it. It’s silly really, because why have it hiding away in my cupboard, when it could be made into something I might actually use and enjoy. I don’t know what it is. For one, I just don’t trust my sewing skills enough. And I can never decide what it is worthy of becoming–a simple pillow, a quilt, a bag…? So, the truth is, I’ve got a big stash of fabric that I love and have yet to work up the courage to actually cut into. Cutting, stitching–it’s all so permanent. But, when Kristen sent me a new batch of fabric recently, she made me promise I’d cut into some of the fabric that she’d given me in the past. So this week I finally worked up the nerve and put some to use. Technically, I did cut the fabric but I think this is really baby steps in my "favorite fabric cutting therapy". I got the four cork board tiles at Target. And my initial thought was that I would use these as little inspiration boards above my desk. But once they were all made, the idea of sticking little pins through the beautiful fabric was too painful to think about. So they became some fresh artwork for above the bed. So I did it. Baby steps, but I did it. And a big thank you to my husband who measured and hung the boards while I got to slip out of the house and run a few errands all. by. my. self. xo. molly, they look great! i have the same problem – i find it hard to cut the fabrics that i really love. baby steps are good. They look really great. And all by yourself? That must have felt fantastic. Woohoo! I’m impressed, you have earned yourself a new batch… I’ll just give you a moment to recover. Looks great, soooo much better than just folded up on a shelf somewhere. well, consolation; they look beautiful!!!! I have the same problem. I have a very hard time cutting my “good” fabrics. And for the same reasons as you. My husband thinks I’m crazy when i say I have no fabric. I just have piles I can’t cut into. Love what you have done with theat fabric! yay! those are gorgeous. lucky you! I have the same problem with cutting into fabric – I’m too scared I’ll wreck it or use it for the wrong project! 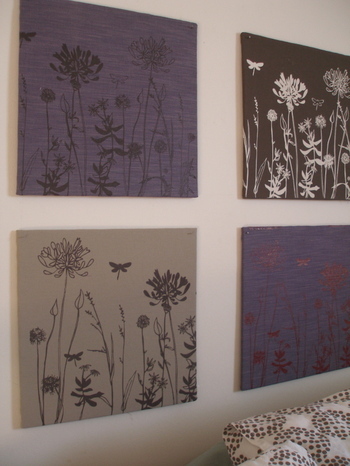 But those boards look lovely, a great way to show of some gorgeous fabric! Good for you! I have a hard time cutting fabrics, too, so I feel your pain. The boards are lovely. Maybe I’ll make those pillows I’ve been avoiding (cutting). I have the same problem with yarn. i have baskets full that i won’t knit because i convince myself that a better project will come along for it, or that i might mess it up and can’t ever use it again. miss you, love you! These are gorgeous – I love the fabric and now you get to enjoy it all the time! Yea! I love what you did with the fabric Molly! Every time I see this I tell my self I’ve got to do that!! The fabric is so beautiful, who makes it? that is such a beautiful idea to use that fabric Molly. And now, its there when you’re ready to remake it into something else. That’s my rationale when I have fabric I covet, just make something using a big enough piece of fabric that I can one day remake it into something else when I’m really ready to cut into it. i feel the same way about so many of my fabrics espeically the new Etsuko ones. These look great – i love the idea! i wonder what fabric that is?Thanks for your comment on my shop update. i get the organic cotton onesies and tshirts from MEC/Mountain Equipment Co-op. i like to keep several on hand for those birthdays that creep up on me.